A neck and shoulder wrap that you heat in the microwave or chill in the freezer can be an easy and inexpensive way to help ease a variety of ailments without any side effects. The best heating pads for neck and shoulder pain are the ones infused with aromatherapy blends that can help soothe sore muscles and relieve stress. In order to get the best type of moist heat therapy, these wraps are made with soft fabrics and are filled with heat retaining natural grains like flax seed, rice, corn or wheat. They will stay warm for extended periods and have a soothing scent when heated (although if you prefer no fragrance, those are available as well). 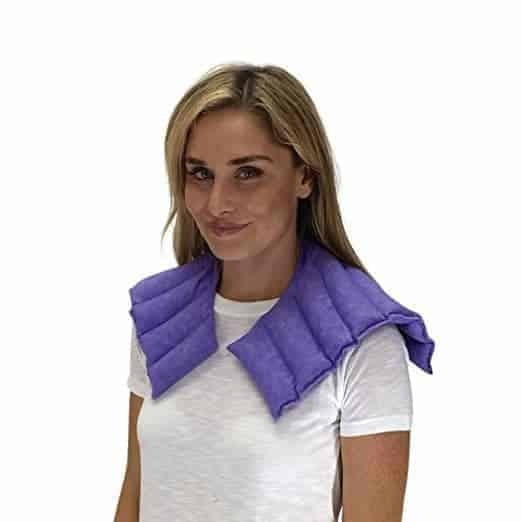 If you are suffering from stress, pain, insomnia, tense muscles, cramping, arthritis or headaches, you will enjoy the many benefits that you can get from a microwavable heat and shoulder pack. The material is soft and thick. This design from Huggaroo has the full neck and back coverage, so it is excellent if you want to wear it when moving around or you don’t want to have to adjust it. It is quite heavy, which some users prefer. The heaviness gives you are a little bit of pressure therapy and help it stay in place. Currently, it only comes in the blue color in a thick, plush fabric that most people like. The fragrance is subtle, and most people don’t find it overpowering. Filling: Heat-absorbing clay beads, flax seeds, lavender, peppermint, lemongrass, and chamomile. The Herbal Concepts Comfort Neck and Shoulder Wrap is a good option if you want a little more weight in your neck wraps. The high collar design and the weight distribution make it especially useful if you are having neck or shoulder problems, mainly because this product feels like it is stretching the tight shoulder muscles that connect your shoulders to your neck. The scent isn’t overpowering or very noticeable, and the moist heat is very soothing and helpful for pain. This neck wrap is also quite durable, and if treated well, it should last for a very long time. The product is filled with 12 herbs and natural grains. Some users may find the scent too strong. Nature Creation’s Neck & Shoulder Wrap is a beautiful, well-made, effective wrap with a relaxing scent. It works equally well as a hot or a cold pack that will help relieve pain and promote body relaxation. It is useful sore muscles, achy joints, injuries, arthritis, tendonitis, stress relief, and chronic injuries. The filling is a mixture of 11 different herbs as well as flaxseed and wheat. It is reusable, 100% natural, made in the USA, eco-friendly, and pet safe. It comes with a 30 Day Money Back Guarantee. It is easy to fold if you need to target specific areas. Nature’s Approach is an excellent option if you want a thinner style that is easy to place around your neck or to put on your head without it feeling too heavy. You can heat it in the microwave or freeze it to help get pain relief in the area you need. It smells nice and works well for most body aches and migraines. 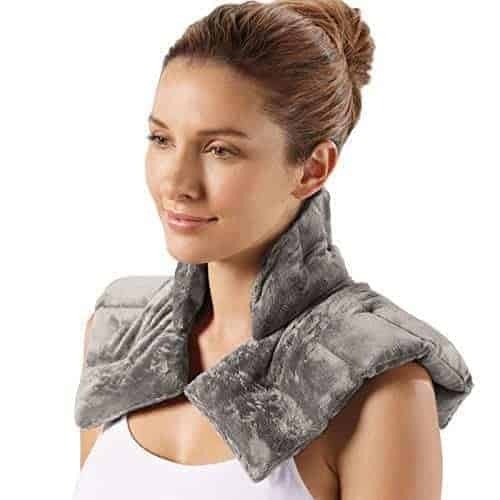 This TheraSpa Herbal Hot/Cold Neck & Shoulder Wrap is excellent for sore neck and shoulder muscles. The cover is a soft fabric, and it has a tall neck, so you can get relief for the entire neck area at one time without having to move the pad around. The smell may be a little strong for the first few uses for some people. Happy Wraps are a top-rated option if you are looking for a neck wrap. They come in a variety of colors, and they include a matching lavender eye pillow to help you sleep. 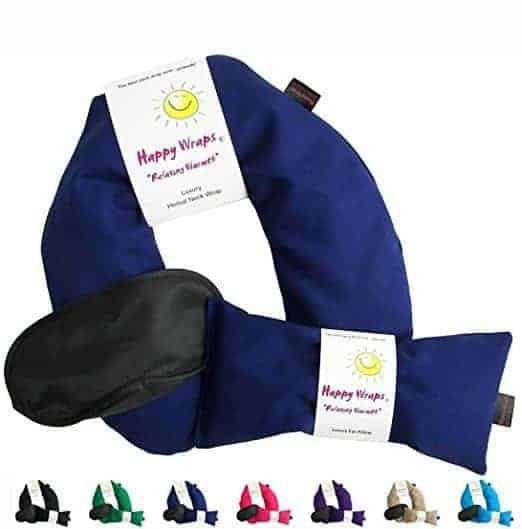 The Happy Wrap Neck Wrap can help with stress relief, neck pain, arthritis, and migraines. They are filled with a 12 herb blend that includes chamomile, cinnamon, and mint, as well as organic flax seeds. To use for heat therapy you can put the wrap in the microwave 1 minute, or to apply for a cold treatment you can chill in the freezer. It weighs about 2.5 lbs and comes with a 30-day money back guarantee. Filled with: Chamomile, peppermint, spearmint, rosemary, lemongrass, cinnamon, lavender, white willow, yarrow, saw palmetto, yellow dock root, valerian, flax seed (great for creating moist heat therapy). Why Use a Neck and Shoulder Wrap? Tension and stress can settle in your shoulder and neck muscles leading to pain, tension headaches or in some cases injury. You can also get sore neck and shoulders muscles from exercise or your job. A heated neck wrap is a quick, inexpensive therapy to help soothe sore muscles and painful tension that doesn’t take very long has no side effects and can be very soothing and relaxing. When you apply heat to your muscles, your blood vessels open up and help to increase the elasticity of the tissue, allowing your muscles to relax. 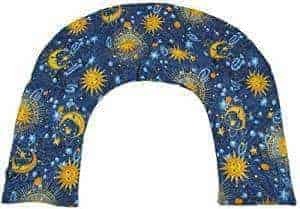 Microwave neck wraps also provide a ‘moist heat,’ which is different than what you get when using an electric heating pad. Moist heat is often recommended by doctors for pain caused by injuries because it can get deeper into muscles to help with pain relief than other types of heating pads. Filing– Most heating packs are filled with, rice, flax seeds, wheat or corn. The filling needs to be safe to put in the microwave and is often also filled with a mix of herbs to give off a pleasant scent when heated. All of the fillings hold heat for around the same amount of time, although flax seeds may have a slight edge over the other types of fillers. Rice is a standard option when making a heat pack at home, although it may break down sooner than other filings. Corn is another favorite filling, but it may give off a ‘popcorn’ type scent when heated, so if you are sensitive to smells, you may want to avoid it. Design– There are some different types of designs to choose from. The standard design is a long rectangular shaped wrap that you can rest on your shoulders and move around to problem areas. Other types of designs include square shaped pads or more neck specific products that rest on your neck and have a high collar that covers the entire neck and shoulder without having to be moved. It is best to look for designs that are going to fit comfortably on your neck and shoulders and stay there. Scent– Generally the most popular neck wraps include aromatherapy scent to help add a soothing element to the product. If you have migraines and would prefer to have an unscented product some companies offer unscented options, although you may need to contact the company directly. Many of the products that do include herbs for scent have quite a few ingredients, so if you have any allergies ensure that you pay particular attention to the filling ingredients. Fabric cover – The fabric covers for almost all of the neck and shoulder heating pads are 100% cotton or a cotton blend. Cotton works well when it is heated in the microwave, but like anything, it can burn if cooked too long. Some products come with an outer covering that can be removed and washed. Outer covers come in a variety of different types of plush fabrics like minky or organic cotton fleece with many kinds of fabric patterns. Heat Retention– To ensure you get a good neck wrap you will want to find a product that holds the heat for around 30-60 minutes. Depending on the size and the design you will get this amount of heat retention with most quality products. 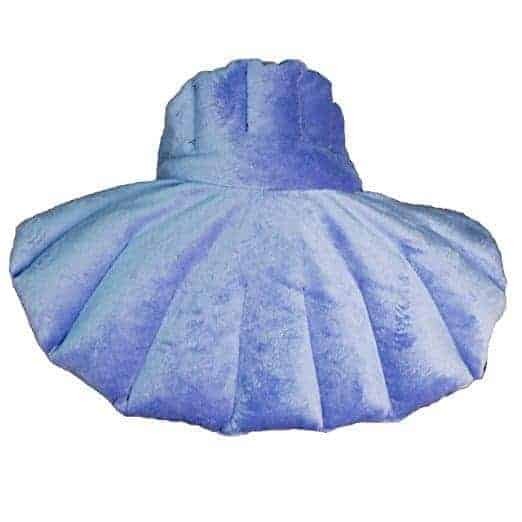 If you are concerned about how to keep your neck wrap clean, you may want to look for a product that has a removable cover that can be taken off and washed. If you want to prolong the life of the fabric, you should wash the cover on a gentle cycle or by hand. Most inner packs are not meant to be washed. Products that don’t have a removable cover can usually be spot cleaned and then air dried. Using heat or cold packs could not be simpler. To use for heat therapy, you place the pack into the microwave for the amount of time that is specified for the product you have purchased. The heating time may vary depending on the power of your microwave. Do not heat for longer than directed, as it may burn the filling and cause an unpleasant odor. If you are worried about overheating, warm the product in 30-second intervals to avoid the risk of burning the contents. Once heated, you can place the pack on the area that is painful or tense. When the product has reached room temperature, you can reheat. If you do not have a microwave, some packs allow you to heat them in the oven by wrapping them in aluminum foil and then cooking on low heat for a set amount of time (do not leave unattended). See directions that come with any product that you purchase. For cold therapy, place the pack in a plastic bag in your freezer for approximately 1-4 hours until it has reached a level of cold that will be comforting for your ailment. Cold therapy is an effective treatment for reducing inflammation as well as for strains, sprains, and swelling. Microwave heat packs are generally considered pretty safe to use. There are no known side effects to using heat packs, and they are not thought to be a dangerous product if used correctly. There are however a couple of safety precautions to take when using these products. You should always use as directed. If the pack is damaged, you should discontinue use, and ensure that the filling won’t be ingested by a small child or pet. Never use heat packs on anyone with impaired sensation or infants. Don’t overheat the wraps, because it may burn the contents or cause burning when picked up or put on the skin. Make sure the pack does not get wet. Check ingredients of the filling if you have allergies. Check the temperature of the wrap before you place it on your body. Heat and cold wraps can be incredibly helpful for many different conditions. Here are just a few ailments that would benefit from the use of a heated neck and shoulder wrap. 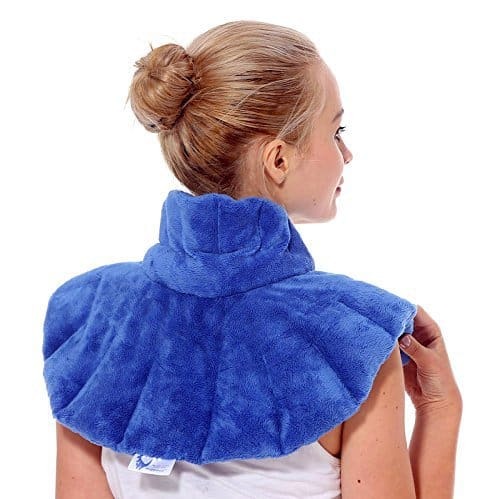 Using a microwave heated wrap is a simple, safe and very effective way to help deal with pain, tension, discomfort or injury in the neck and shoulder muscles and joints. These types of products for heat therapy can help ease joint pain, sore muscles, and headaches. Or they can be effectively used as cold therapy for decreasing muscle spasms, and inflammation. They are also fantastic to use the aromatherapy and soothing warmth of the wraps to help with stress reduction or to warm you up on a cold winter’s day. These excellent little wraps will help get rid of stress and tension, leaving you more comfortable and hopefully pain-free.